On August 25, 2016, the world was shocked by reports that striking miners in Bolivia had brutally tortured and murdered Bolivian Vice Minister of the Interior Rodolfo Illanes. Sent by President Evo Morales to negotiate with the mining cooperatives in the southern city of Panduro, it was suggested that Illanes knew his assailants personally. What caused members of Bolivia’s mining cooperatives, historically ardent supporters of Morales, to commit such a heinous act? Across the world, commodities-dependent economies have fallen on hard times. Nowhere has this been more problematic than in South America, where extractive industries such as gas, oil and mining have accounted for large shares of exports, GDP and state revenues and budgets. In recent years, the mining industry has been a thorn in the side of Evo Morales and his ruling MAS (Movement to Socialism) government, and as prices for tin, silver, zinc and lead have fallen, the Bolivian mining community has grown increasingly restless. Lower salaries for miners lead to increased potential for political disturbance or even outright opposition to Morales’ government. It’s been observed that when it comes to the rhetoric of Evo Morales, his bark is often worse than his bite. He takes a very hardline left-wing approach in his public discourse, railing against capitalism and neoliberalism. He has even gone so far as to state that capitalism “is the worst enemy of humanity.” He has pursued a series of widely publicized nationalizations of the nation’s oil, gas, and mining sectors. Even close ally Lula da Silva was enraged by Morales’ insistence on privatizing oil and gas investments made by Brazilian giant Petrobras in 2007. Investors have good reason to be fearful of placing large bets in Bolivia; a country with a history of political instability, commodities boom and bust cycles, nationalizations, inadequate transportation and infrastructure and labor unrest. While Morales has not tacked as hard to the left as close allies Cuba and Venezuela, he has also not exactly been the poster boy for investor confidence. After beginning with a year-long nationalization of the hydrocarbon sector in 2006, 2007 marked a disastrous year for foreign mining companies in Bolivia in which tax rates skyrocketed, mining concessions and licenses were revoked or unfavorably altered, and many valuable properties were summarily expropriated. 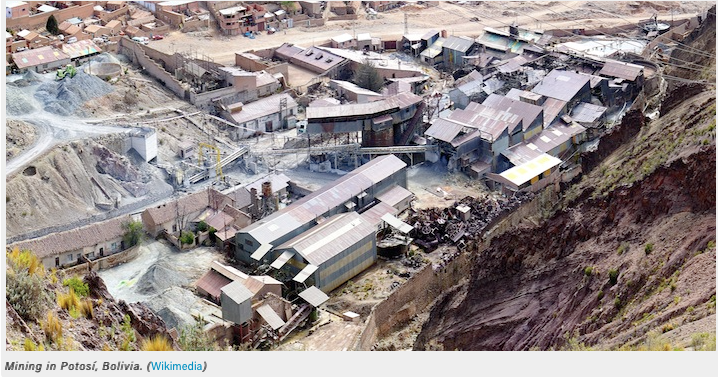 But an analysis of Bolivia’s mining sector reveals that Morales’ administration may not be as antithetical to the tenets of capitalism as one might think. For example, while Morales has privatized several large scale mining operations, the state’s involvement in the mining sector is actually rather small. In 2013, for example, the state-owned mining sector accounted for just 8.6 percent of total mining output (approximately $292 million) and just 5.8 percent of the mining workforce (or around 7,900 workers). Contrast that to the private sector that accounted for 62 percent of output (approximately $2.1 billion) and just six percent of the workforce (around 8,100 workers). The private sector output would undoubtedly be much higher were it not for the extremely high tax burdens placed on the sector: rates which typically reach 60 percent to 70 percent. Yet, in addition to the private and public sectors, Bolivia also has a powerful miners’ cooperative, called the Corporacion Minera de Bolivia, or Comibol. It accounts for roughly 29 percent of mining output ($982 million), but a whopping 85.2 percent of the workforce. In other words, Bolivia’s private mining cooperatives, which have been a key support base for Morales, outnumber their state-employed counterparts by nearly 15:1. The torture and murder of Illanes was a brutal and ill-advised move that has galvanized public opinion against the mining cooperative, and played directly into Morales’ hands. Mining cooperatives have a long list of grievances against the government. They want relaxed environmental regulation, greater access to mine locations and technology, increased state support, and are concerned about government plans to allow unionization within the cooperatives. Additionally, they have demanded the right to work together with private corporations. As of now the Bolivian government mandates strict separation of private companies and cooperatives. Evo Morales and his left-wing administration have become increasingly concerned over the economic stratification within the cooperatives, derisively referring to it as encroaching capitalism, and have suggested that the cooperatives have strayed from their original mission of providing equal opportunities and wages for their members. Yet, clearly, there is a structural problem when the private sector is astoundingly more productive than the state and cooperative sectors. Morales, along with many other pink tide leaders, is between a rock and a hard place. A nation such as Bolivia has limited prospects with international lenders, so it must maintain a relative degree of fiscal austerity and self-reliance. Morales knows that the oil, gas, and mining sectors are of crucial importance to GDP, exports, and government revenues. Without them he does not have sufficient funds to invest in his social, political, and economic development programs. But at the same time, he is wary of alienating indigenous and rural communities who expect him to maintain strict environmental regulations, regardless of the negative impact on extractive industries. Further complicating the matter, is the reality that his western neighbors Peru and Chile have long had a more business-friendly and equally rich mining landscape, offering a more lucrative proposition for potential foreign investors. In his remaining three years, more out of necessity than conviction, Morales is likely to liberalize the mining environment, and incentivize foreign investment in the sector. However, his challenge will be to keep the state and cooperative sectors happy, while dealing with the potential backlash from the Bolivian hard left. This entry was posted in Bolivia, Business, Economics, Environment, Mining, Politics, Social Unrest and tagged demagogue, democracy in peril, government failures, Ochlocracy, public policy failures. Bookmark the permalink.